Today I was weeding my front lawn and came across some good luck. I found 15 four leaf clovers in one clover patch. Incredible, huh? 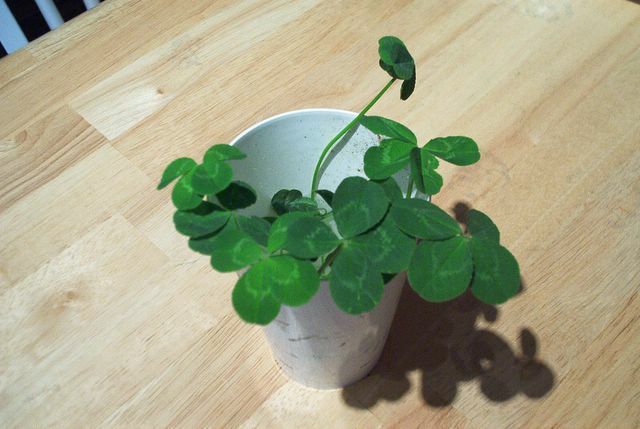 You may be thinking 'I have never found a four leaf clover, that's amazing.' But the really upsetting thing is that isn't my all time best. In one day, years ago as a teen I found 32. Now that is incredible. (Yes I am gloating.) What I find to be even more strange is that where ever I have lived I have been able to find numerous four leaf clovers. What are the stats on that? How rare is that? From Ohio, Iowa, Colorado and now Virginia I always seem to have a plethora in my yard. Maybe I'm just prone to find them. I am told that I am very observant, that could be an answer to my ability, I really don't think I am that lucky. So maybe, just maybe, finding a four leaf clover is not that rare. I think about how busy everyone is in their daily lives and under their feet are all these four leaf clovers. Hmmm. It really make me wonder. Bouquet of clover we found in the garden.